Lara Baladi, 〈Don’t Be Too Candid〉, 2018. Mixed Materials, 2018 Gwangju Biennale Entry. As a new even-numbered year arrived, Korea relished the opportunity to celebrate the “season of biennales” once again. With the 5th Daejeon Biennale (July 11 to October 21) serving as the starting point for the season, there followed the 8th Geumgang Nature Art Biennale (August 28 to November 30), the 4th Changwon Sculpture Biennale (September 4 to October 14), the 10th Seoul Mediacity Biennale (September 6 to November 18), 12th Gwangju Biennale (September 7 to November 11), 9th Busan Biennale (September 8 to November 11), 7th Daegu Photo Biennale (September 7 to October 16) and the inaugural Jeonnam International SUMUK Biennale (September 1 to October 31). As the list suggests, the banners of these biennales were fluttering all over Korea last year at almost the same time, as if to say that they are competing with each other. However, rest assured that this is most certainly not the case. Next year, an odd-numbered year, will see the appearance of another assemblage of biennales, and while there will be comparatively fewer dedicated to fine art, art lovers will still have several events vying for their attention across Korea. These events will include the Gyeonggi International Ceramic Biennale, Cheongju Craft Biennale, Gwangju Design Biennale, Seoul Biennale of Architecture and Urbanism, Seoul Typography Biennale, World Calligraphy Biennale of Jeollabuk-do, Gangwon International Biennale, and Jeju Biennale. In total, there are 16 biennale events being held in Korea alone in this two-year period. Superflex, 〈Foreigners, Please Don’t Leave Us Alone with the Danes〉, 2002. Wall Painting, Poster, 2018 Gwangju Biennale Entry. While there is rampant enthusiasm seemingly everywhere about the biennales, the response from opinion leaders in the Korean art world has been rather lukewarm. The biennial art events for 2018 have completed their long run at last, but critical feedback has dwindled considerably compared to the past. What is the cause of this? If the biennales are supposed to have become a major catalyst for discourse on contemporary art, shouldn’t there be expert views, whether they be appreciative or critical, to help these events promote discussion? If not, why even have such events around us? Who are these biennales being held for? It is my firm belief that a biennale should be both “seen,” and “talked about.” While there may be criticisms that go too far, arguing that all these biennales are useless, we nevertheless need to accept that even such critical voices contribute to the proper functioning of the contemporary art scene. The purpose of such criticisms should be to better read the contemporaneity of art through these biennales. The problem is, however, is that it is difficult for ordinary art lovers to have access to these events. (Those who are looking for “easy” art would likely find it simpler to go to a blockbuster exhibition held at a major art gallery nearby or even an art fair.) A biennale is generally regarded as an event where one can get access to a condensed form of that which is on the cutting edge of contemporary art. Wouldn’t it be the exhibition of new works and on-site production that form the most conspicuous feature of the biennale? Think about the variety of rhetorical expressions used when describing contemporary art, such as “laboratory,” “navigation,” “compass” and “platform.” It is through the elements of avant-gardism and dynamism that make up biennales that we are able to catch the meaning of the flow of the “stream” of contemporary art, which moves like a “living organism”. This, however, does not necessarily mean that we can easily find a solution to tackle this tendency. It is the biennale, the “living theater,” that raises questions about “today of the approaching future,” and provides a venue for hot debates about this matter. That is why none of the biennales from around the world have become a subject for either perfect “praise” or perfect “criticism”. What is important is to present a diverse range of critical views. If a biennale is able to incite a variety of conflicting views, and thus make enough noise to attract the attention of all those concerned, we should consider that the biennale has achieved its goal of promoting discourse on art. In this review, I will deal with, and compare, two of Korea’s most successful biennales, the Gwangju Biennale and Busan Biennale, by focusing on the global standards which they are expected to meet, and by judging whether they are able to provide a venue for public discussion on the subject of contemporary art. The effort to “read” the meaning of these two biennales is closely connected with finding the direction today’s art is heading in and interpreting the flow of the stream of art across the world. Last year’s Gwangju Biennale was organized and run by a group of eleven curators, led by Kim Sunjung. The outset of the Gwangju Biennale for the year 2018 was smeared by the scandal over the role of the head of the biennale foundation, who had gained control of even curatorial duties. It turned out later that the biennale was being organized and managed by a number of curators, who were supervised by the head of the biennale foundation. Institutionally and ethically, it would be natural for the head of a public organization to remain faithful to his or her duties regardless of the level of success achieved by an event held under his or her administration. The reality is, however, that the success of an event can change the system, or even the rules of the game, that they are engaged in. For biennales held elsewhere, it is not uncommon for one chief curator to hold his or her position for an extended period spanning several decades, while in Korea, this would be unthinkable, at least for the time being. This situation reminded me of the 9th Gwangju Biennale, held in 2012, where Kim Seon-jeong, the head of the biennale foundation, led a group of five curators for the year’s event. Lim Minouk, 〈Live Broadcast〉, 2018. Mixed Materials, 2018 Busan Biennale Entry. Considering the themes of last year’s Gwangju and Busan Biennales, they appear to be closely related, almost as if they had been organized by the same curator(s). The words used to capture the meanings of the exhibits often overlap, and focus on the current situation going on in the world, depicted by the expression, “global crisis,” and the actions art is taking to tackle it. The current global society, born through the relentless forward momentum of the capitalist economy and the development of information technologies, guided its citizens to dream of a utopia based on a new world order following the conclusion of the Cold War. Sadly, however, the dream of this utopia has been crumbling away. The September 11th terrorist attack that occurred at the very beginning of the 21st century, followed by conflict in the Middle East, the Lehman Brothers shock in 2008, the recent crisis in Greece, Brexit, and the birth of the Donald Trump administration, which many regard as a reaction to globalism, have effectively crushed the dream of a global society. The expansion of economic inequality, increase in the number of refugees, and rise of progressively more complex political confrontations have all greatly affected the activities of artists and curators who are struggling to break free from Western-centric thinking and move global art forward. The rise of the globalized world in the post-colonial period has affected the theories and practices of modern art, leading to the development of video and photographic media, particularly after the Documenta Kassel in 2002, guiding art critics to explore questions concerning a variety of conflicts caused by globalization. For example, art historians such as T. J. Demos label the situation after the 9/11 “crisis globalization”, raising questions about the relationship between the contradictions contained in it and artists. He claims that the paradigm of contemporary art in the 1980s and 1990s had been under the romantic “nomadism” concept, and that currently, art comes to the fore as a critical documentary, to be equipped with our imagination and intervene in the aspects related to human lives migrating on a global scale, such as exile, diaspora and refugees. 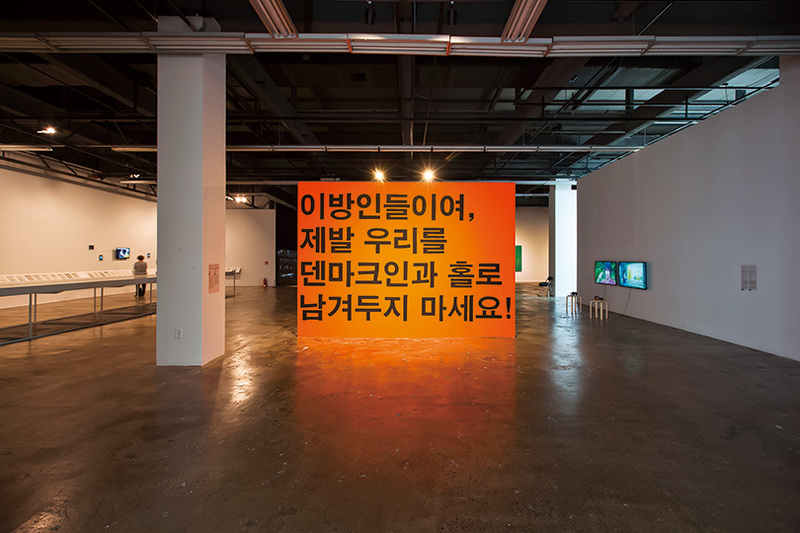 Considering their themes alone, both the Gwangju and Busan Biennales appear to have effectively captured the current circumstances on the front lines of contemporary art. The themes befit the political situations which have recently developed regarding the relationship between South and North Korea, and are thus highly topical. Last year’s Gwangju Biennale can be divided into three sections, according to the exhibition spaces. The first section, located in the Biennale Hall, presents works focusing on four topics: (1) 《Imagined Nations / Modern Utopias》 (curated by Clara Kim), (2) 《Facing Phantom Borders》 (Gridthiya Gaweewong), (3) 《The Ends: The Politics of Participation in the Post-Internet Age》 (Christine Y. Kim and Rita Gonzalez), and (4) 《Returns》 (David Teh). 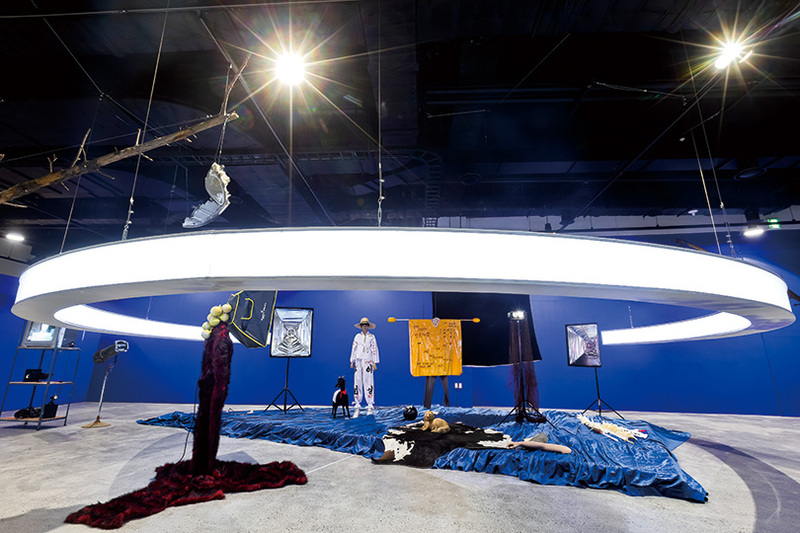 The works exhibited at the Asia Culture Center (ACC) Creation Hall were grouped into three topics: (5) 《Faultlines》 (Yeon Shim Chung and Yeewan Koon), (6) 《The Art of Survival: Assembly, Sustainability, Shift》 (Man Seok Kim, Sung woo Kim and Chong-ok Paek), and (7) 《North Korean Art: Paradoxical Realism》 (B.G. Muhn). As part of the biennale, a collection of works under the title 《GB Commissions》 was on display at the former Armed Forces Gwangju Hospital, and the 《Pavilion Project》 was held at many locations in downtown Gwangju. The biennale featured a total of over 300 works created by 165 individuals and teams from 43 countries, grouped into seven categories headed by 11 curators. The figures show that it was the largest of its kind ever held in Korea, and also larger than other major events around the world, such as the Berlin Biennale (featuring 46 artists in 2018), the Skulptur Projekte Münster (featuring 38 artists in 2017) and the Istanbul Biennale (featuring 56 artists in 2017). There is a story behind this. Last year’s Gwangju Biennale was originally planned to be held only at the ACC, due to the planned construction for the new Biennale Hall. This plan later changed, however, under the opinion that the event should be able to take advantage of the symbolic importance of the existing biennale hall, resulting in the event’s increased scale. Other factors, such as the organization of sections and visitor routes, led to an increase in the size of the exhibitions. The personal ambitions of Kim Sunjung, the ACC’s new director, likely also played an important role in this change. She may have felt that, as the new head of the organization hosting the event, she needed to express her ‘care’ for Gwangju, or her will to use the power bestowed upon her in a fuller manner. The fourth section, titled 《Returns》, was more of an archival exhibition than an event focused on a single theme. The importance of archives may not be emphasized enough in art today, but the inclusion of archival works in a themed exhibition seems to be missing the target. Furthermore, as its title, 《The Art of Survival: Assembly, Sustainability, Shift》, suggests, the sixth section featured works under three different themes which had been lumped together in a rather forcible manner. The curators’ profiles, as well as the characteristics of the individual works, were far too broad in scope to be brought together under the same title. This particular exhibition was, in fact, divided into three parts, respectively titled 《Symmetrical Imagination》, 《Momentum Temporary》 and 《Assembly Place and Non-Place》. The titles seem to be too conceptual in nature for the casual observer to grasp their meaning, thereby driving, when combined with the ineffective visitor routes, visitors to exhaustion before they have even completed the tour. The exhibition might have achieved the purpose of presenting works by Korean artists, but it was, unfortunately, poorly organized in terms of format as well as content. That being said, the curators may wish to console themselves with the fact that they were able to invite as many as ten local artists born in Gwangju and Jeollanam-do Province to participate in this section of the biennale. The seventh section, 《North Korean Art: Paradoxical Realism》, may be historically significant in that it became the first of its kind to bring large pieces of North Korean collective paintings, known as "Joseonhwa," to art lovers in South Korea. The reconciliatory atmosphere that has recently emerged between the two Koreas aided these paintings in receiving greater attention from viewers, but one may rightly point out that they would have been better placed in their own special section, rather than in the international section. One can then justly criticize that last year’s Gwangju Biennale had too many branches to be treated in an organized manner under a theme titled 《Imagined Borders》. The works were arranged rather confusingly, preventing visitors from finding the key elements in the exhibited works which were connected with the main theme of the event. In my opinion, it would yield a better result if Sections 1, 2, 3 and 5 were housed in the Biennale Hall, Section 4 in the archival exhibition, and Sections 6 and 7 grouped together in a special exhibition. Last year’s Gwangju Biennale can then be compared to a thesis with poorly-organized content which makes it difficult to grasp the topic being discussed. It may not be difficult to understand for trained experts who have knowledge of the biennale’s background, but for ordinary viewers, it would be a daunting task to perceive the meaning of the exhibited works. The organizers of last year’s Gwangju Biennale may feel it is unfair to receive critical responses such as this. The situation could, however, be worse, as it appears there were some who regarded it as being inferior to the Busan Biennale, even raising questions about its cost-effectiveness. The first section, 《Imagined Nations / Modern Utopias》, was a fine, carefully prepared exhibition focusing on the intersection of modernism, architecture and nation-building that occurred in Latin America, the Middle East and Asia during the period of social and political upheaval from the 1950s to the 1970s. The works exhibited here created a lot of excitement in me, because they contain more detailed background information, rather than just paintings or sculptures. I was particularly interested in the situations in Brazil, Mexico, Cuba, India and Kuwait, because they provided vivid reflections on the situation in Korea during the period of rapid industrial development. Unfortunately, however, the works in this exhibition were largely limited to those of artists, photographers and film directors, as well as architectural works, depicted in black and white images taken many long years ago, dealing with stories from the remote and distant past. That is why these works curtailed the topicality of the biennale from the outset. This section was chosen to be discussed first, nevertheless, because the main theme of the biennale, 《Imagined Borders》, is a combination of the themes of the first section, 《Imagined Nations / Modern Utopias》, and the second section, 《Facing Phantom Borders》. The themes also reflect the passage of time flowing from the past to the present, with the first section serving as a prologue. Lawrence Sumulong, 〈Urban Legend〉, 2012. Archival Pigment Print, Featured in 《Imagined Nations / Modern Utopias》, the first section of the Gwangju Biennale. The second section of the Gwangju Biennale deals with Southeast Asia’s geopolitical complexity, focusing on borders and immigration. 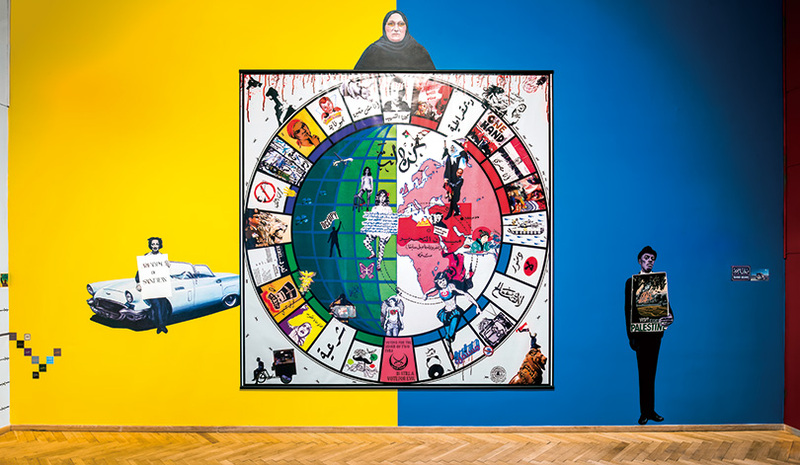 The problems of immigration, refugees, and deportation are topics which are highly regarded by the international art world these days, after being highlighted at the Documenta Kassel held in Germany in 2017 and the Berlin Biennale held in 2018. I was particularly attracted to the work 〈I Was Born in Indonesia〉 by Australian artist Tom Nicholson, which takes a critical look at the issues of refugees and Australian immigration policy by presenting 110 white resin cast diorama figurines busily moving about as they prepare for immigration. The artist collaborated with the Indonesian curator, Grace Samboh, to create a series of video works based on interviews with refugees and asylum seekers. Other works in this section which attracted my attention included 〈The Fence〉, a 10-meter-long cardboard relief sculpture, created by Agnieszka Kalinowska, to present the stories of asylum seekers, 〈Köfte Airlines〉 by Halil Altindere, which captures the image of a group of Syrian refugees sitting on an airplane, and 〈Reconstructing an Exodus History〉 by Tiffany Chung, an embroidered world map which depicts statistics on the migration of refugees. The third section, 《The Ends: The Politics of Participation in the Post-Internet Age》, similarly confused me as to its purpose. The problem here was that I was still unfamiliar with the meanings of “Post-Internet” and “Post-Internet Art.” Living in the world after the spread of the Internet, which has penetrated deep into our daily lives, blurring the lines between the real world and the Internet, our senses now tend to be defined by this new form of reality which the Internet has created. It is not only a tendency in the world of art, but rather a widespread phenomenon across our society. The way of expressing human consciousness and reality based on the Internet began to be widely explored in the second half of the 2000s. The use of the term “Post-Internet” was proposed in 2008 by Marisa Olson, an American artist, critic and curator, resulting in the creation of the expression “Post-Internet Art,” used to refer to artistic expressions created under the influence of the Internet. The ninth Berlin Biennale, held in 2016, sparked controversy by hiring DIS, a proponent for the Post-Internet lifestyle, as its curatorial team. Lara Baladi, an acclaimed Egyptian-Lebanese artist who experienced the Arab Spring in 2011, constructed an online archive of the freedom movement called Vox Populi. One of the latest additions to her immense archive, 〈Don't Be Too Candid〉, presents a wide range of iconic and archetypal images of asylum seekers and refugees, including those of a balcony where a political assassination takes place, graphs displaying data on global politics, the Gwangju Uprising and the Egyptian popular uprising. In her work, 〈Porosity Valley, Portable Holes〉, Kim Ayoung presented an audio-visual collage dealing with histories and myths and the dissonances they contain, using foreign visual materials. Among the other notable works in this section, there is 〈Every Smooth Thing through Mesher〉, a work by Kim Heecheon, in which the artist interjected a virtual novel into real time and space and alternately shifted between them to demonstrate the influence this can have on the ways that reality unfolds. As well, the Chinese Internet artist, Miao Ying, made an information booth in wrapping paper which was used for the promotion of a newly released commercial item at a trade fair. Titled 〈Chinternet Plus〉, the work uses ideology as a marketing strategy by presenting a shanzhai (i.e. illegal copy or counterfeit) of Internet Plus created by the Chinese government for big data. The event held under the title 《Faultlines》 at the ACC is an exhibition conceived from the geological concept of a fault, a fracture in the continuity of a rock formation caused by a shifting or dislodging of the earth's crust. The exhibition is aimed at providing a comprehensive view on various issues causing social, political and psychological splits. The effort to apply the concept of faults to both the form and content of artworks resulted in the creation of a wide spectrum of works which deviated from artistic formalism, represented by the abstract art of Kim Minjung and the multi-layered installation work, 〈Nursing Modern Fall〉, by Inci Eviner. In the latter, Eviner presents the story of divisions created during the formation of the modern period in the West through the juxtaposition of the history of airplanes and the ideal of interior architecture. The exhibition also includes the installation work, 〈Untitled〉, by Tara Donovan, which features a fissure created by the curves of light shed from the source, made by combining several hundreds of thousands of transparent plastic cubes. While I was drawn in to these works in this exhibition, I felt that they didn’t fit perfectly with the central theme of the biennale as a whole. ＊This content was first published in the December, 2018 release of Art In Culture and has been re-published on TheARTRO.kr after a negotiation was reached between Korea Arts Management Service and Art In Culture.